Click here for audio of Episode 415. Today, a new technology that can't find its footing. The University of Houston's College of Engineering presents this series about the machines that make our civilization run, and the people whose ingenuity created them. That was a vain hope. Ben Franklin had already written that a balloon might be used for "... elevating an Engineer to take a view of an Enemy's Army ..." He didn't stop there. He figured they could also be used for troop movements. "Five thousand balloons capable of raising two men each," he calculated, "could cost no more than Five Ships of the Line." So balloons went to war. The new French Republic used observation balloons against Austria by 1794. The Austrians objected. Gentlemen didn't wage war like that. They rolled out a cannon and whistled two 17-pound balls past a balloon. When the Frenchman landed he was greeted like a WW-I ace. In a blink, those shots made him into a new kind of hero. Soon these new airborne lotharios were smuggling ladies into their gondolas. Aeronauts began drawing bad press with their free-flying antics. Napoleon was lukewarm toward aerial observation. He did take three balloons with him to Egypt. But when British forces destroyed them in a battle, he simply disbanded his aerial unit. Five years later, a remarkable event turned his lukewarmness into outright loathing. Napoleon crowned himself emperor in 1804. To celebrate, André Garnerin sent a hydrogen balloon up over Paris. It was big and beautiful. It carried a great gilded crown into the sky. The next day it came down in Rome -- right on the tomb of Nero. By the wildest coincidence, Garnerin's balloon had laid Napoleon's crown on one of the worst tyrants of all time. And Napoleon was a superstitious man. Military balloons served the Union Army during the Civil War. For a few years McClellan used them to defend Washington. Then old-line conservative officers took over the Army of the Potomac. Balloons struck them as high-tech foolishness, and that ended that. 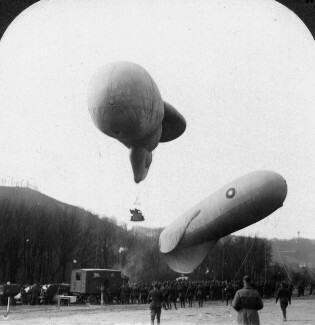 Military balloons came back for a while in WW-I, only to be replaced by airplanes. Observation balloons are joining a new war today -- the war on drugs. We're putting a line of high-altitude radar balloons over our southern borders to spot illegal air traffic. I hope the plan will work, but balloons have a spotty history. We start lighter-than-air systems, but we don't stay with them. I don't know why. Too much fragile beauty? Are they too nearly the stuff of our dreams? In the end, balloons have fared better in our legends than in our daily lives. Rolt, L.T.C., The Aeronauts . New York: Walker and Co., 1966.